As Naturopathic Doctors, we know that your physical body is more than a collection of chemical reactions to be adjusted. By looking closely and sensitively at the bigger picture we can often address the underlying conditions troubling you. Together we can then select the safest and most effective ways to treat you, not just your symptoms. Natural medicine at its best is not so much a substitution of natural substances for prescriptions. It is an intelligent analysis of symptoms that reveals the underlying patterns and causes of the disease process. This type of treatment can relieve the immediate symptoms and improve long-term health. In addition to the pharmaceutical options available at a conventional doctor’s office, we offer Western botanical medicine (herbs), Chinese herbal formulas, nutritional supplements, massage, acupuncture, cranial-sacral therapy, trigger point therapy, and targeted, individualized suggestions for changes in diet and lifestyle. Acupuncture can help treat menstrual irregularities and symptoms of hormone imbalances, depression, anxiety, and many other conditions. We have found it especially helpful for patients dealing with chronic pain, to help healing from injuries, and for headaches. Patients usually find their acupuncture treatments are pleasant and relaxing—not just during the treatment, but afterwards as well. We find that skillfully and sensitively applied massage reduces pain and promotes healing after an injury. 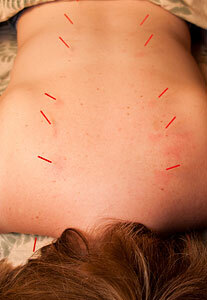 We sometimes use massage in conjunction with acupuncture to deepen the therapeutic effect. Sometimes we utilize the expertise of physical therapists, chiropractors, osteopaths, orthopedic specialists, and physiatrists for better results in less time. We may also refer you to one of our trusted practitioners for other services.